Advancing age is one of the biggest factors affecting a woman’s chance of getting pregnant. Eggs deteriorate in number and quality over time. This decreases the chances of pregnancy and increases the rate of miscarriages. Understanding your options is the most important first step. As we get older, many things change about our health and our bodies. Despite efforts to slow the process of ageing, we are all faced with changes that are part of life. In addition to many of the more obvious changes we experience, advancing age has an impact on fertility. Advancing reproductive age is associated with declining fertility due to two primary factors. A decline in the genetic health of the eggs and a reduction in ovarian reserve cause lower rates of conception naturally and with fertility treatments. 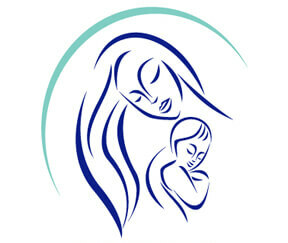 The chances of pregnancy occurring at any given time will decrease as a woman’s age increases. There are many misunderstandings about advancing reproductive age. It’s also important to understand that the reasons for declining pregnancy success with age is also affecting pregnancy chances at all ages. Advancing reproductive age affects a woman’s chances of pregnancy primarily due to the genetic health of the eggs. When the ovary forms, the ovary contains the eggs that last through a woman’s lifetime. The eggs are in a state of arrest and contain a full set of a woman’s genetic information. This genetic information is contained in 23 pairs of chromosomes. When an egg matures and is fertilized, the egg will need to discard half of its genetic information to make room for the genetic information being delivered by the sperm. The egg discards half of its chromosomes in the polar body as the sperm delivers half of the male chromosomes containing the male genetic information. During the process of discarding chromosomes and integrating the male chromosomes, genetic mistakes often occur. The specific type of genetic mistake that occurs due to this sorting process is abnormal numbers of chromosomes. Instead of 23 pairs of chromosomes, or 2 copies of each chromosome, the resulting fertilized egg may have extra or missing chromosomes. These types of genetic mistakes are called aneuploidy. An example of this type of aneuploidy is called Trisomy 21. Three copies of chromosome 21 results from the egg keeping both copies of chromosome 21 and the sperm delivering a third copy of chromosome 21. The resulting embryo will have 3 copies of chromosome 21 instead of the normal 2 copies. Trisomy 21 is the underlying cause of Down Syndrome. Additional genetic mistakes can occur as the fertilized egg begins to divide. The genetic mistakes that occur as the fertilized egg and embryo divide are called mitotic errors. Genetic mistakes in the eggs and embryos is one of the biggest hurdles to becoming pregnant. The majority of genetic mistakes occur from the eggs. Men can contribute genetic mistakes through the sperm. The rate of genetic mistakes contributed by the sperm does not increase with a man’s age the same way the rates of mistakes increase in women. This is due to the fact that the sperm are being regenerated and are typically only several months old. Eggs remain with a woman through her life, and as she ages the eggs continue to age as well. The genetic information, or DNA, remains in a state of arrest, but the egg cell itself continues to go through the ageing process. The ageing process in the eggs will cause an increased rate of genetic mistakes as a woman gets older. The rate of genetic mistakes seems to remain relatively stable before the age of 35. Beyond 35 there is a progressive increase in the rate of genetic mistakes which results in a decline in the chance of a healthy pregnancy. Advanced maternal age is the term used when a woman is 35 or older at the time of delivery. The chart above demonstrates that even at a young age, there are genetic mistakes occurring at a high rate. 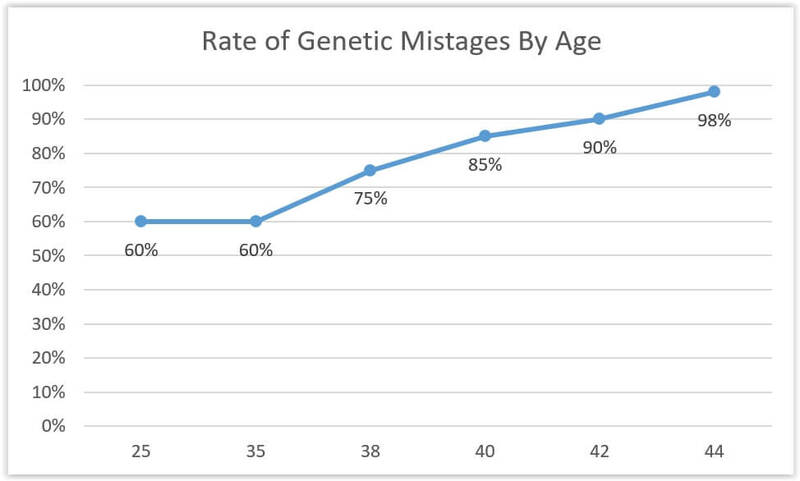 This rate of genetic mistakes increases with age. The majority of genetic mistakes do not make a pregnancy, however when a pregnancy occurs with an abnormal embryo there is a high probability a miscarriage will occur. Abnormal chromosome numbers in an embryo is the most common cause for miscarriages. The risk of miscarriage increases with a woman’s age. In some cases, women may experience a slight delay in their menstrual cycle or may not even be aware a genetically abnormal embryo was formed. These genetic mistakes interfere with natural conception as well as all forms of fertility treatment. When the rate of genetic mistakes increases, one option is to increase the number of eggs collected to help increase the chances of working with a genetically normal embryo. As women age, the number of eggs available during fertility treatments is also declining. Ovarian reserve testing can be used to estimate the potential response of the ovaries to fertility medications. The declining pool of eggs available for treatments is known as diminished ovarian reserve. The combination of declining ovarian reserve and increasing rates of genetic mistakes is what leads to a decrease in fertility, lower chances of treatment success, and increased rates of miscarriages and genetically abnormal pregnancies. Genetic testing of embryos is available to patients undergoing In Vitro Fertilization (IVF). Genetic screening of embryos, or pre-implantation genetic screening (PGS), allows for testing of the embryos to determine which embryos have the correct number of chromosomes. By selecting chromosomally normal embryos, patients will hive a significantly improved rate of success. Success with PGS can be as high as 75% per attempt when 2 embryos are transferred. Genetic screening only looks at the chromosome numbers and dies not examine the chromosomes for their integrity or the correct order of genetic information. Research indicates after age 43, the chromosomes may be numerically correct but may still be abnormal. This is likely occurring at all ages but becomes more common as age progresses beyond age 43. Newer strategies of collecting eggs multiple times are designed to increase the number of embryos available. When combined with PGS, this can increase the chances of identifying genetically normal embryos. Some patients collect eggs on multiple occasions to increase the number of embryos stored so they will have embryos available for future attempts at pregnancy. This is a variation of fertility preservation called embryo banking, By storing embryos at her current age, a woman can use the embryos years later without any age related decline in her chances of success. Age affects the genetic health of the eggs and not the body’s ability to carry a pregnancy. Our multi-cycle plan is ideal for banking embryos with an without PGS. Since advancing age typically affects the eggs, and not the uterus, pregnancy from donor eggs and donor embryos remains a viable option for many women with advanced reproductive age. Egg donors are typically in their 20’s. When eggs are collected from donors, the partner’s sperm is used to fertilize the eggs, and the resulting embryos are transferred to the intended mother. The rate of success can be as high as 75% per try using 2 embryos formed from an egg donor. While using an egg from another person often seems undesirable, the rate of success helps to overcome the financial strain and disappointment that can accompany failed treatment cycles. Our doctors review all of the options available to you and can guide you in your journey to parenthood.